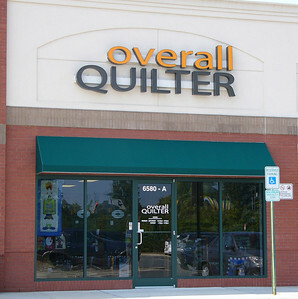 Overall Quilter is owned by Marc and Aimee Griffin. Overall Quilter started in 2006 with a retail shop in Indian Trail, NC. The “brick and mortar” shop is now closed, but the business continues online, at trade shows, retreats and other events. Aimee started quilting 18 years ago after being encouraged by Marc to get a hobby. After 4 years of taking classes and retreats, she started teaching at a friend’s quilt shop. Aimee’s passion for quilting is clearly seen through her eagerness to teach and share ideas with everyone who enters the shop.